Spotted this online, and had to share. I’m pretty sure it’s tongue-in-cheek. A friend of mine recently emailed to get my opinion on composting, and he got more than he bargained for. He wanted a bin for his house, but he was short on space. As you may have feared, I have many opinions on compost! You can do a simple wire mesh enclosure on some wooden stakes, which is cheap and more contained than an open pile, but it will still leave the stuff visible. Middle tier option (and probably the best) is to wait for one of the compost bin sales held by local cities and counties. I got mine at the Orange county sale, but Raleigh and Wake County have their own from time to time. They’re subsidized, and thus about $40. If you want compost “fast”, you have a couple of options as well. 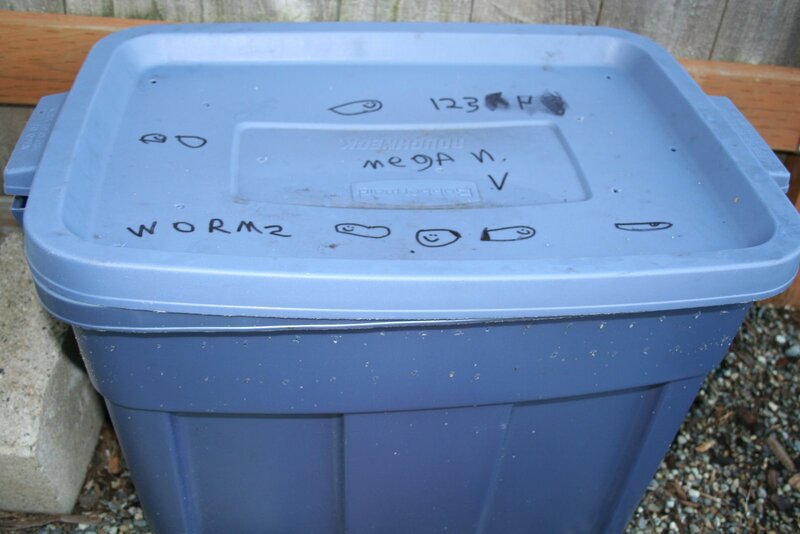 I’m sure I’ve told you about my “worm bin” which is just a big Rubbermaid container stocked with red wiggler worms. It’s actually possible to use this indoors, and it’s great for kitchen scraps. This is what I currently use, and I’d be happy to share some worms. There are also several lines of “compost tumblers” that are barrels on an axle that you can spin from time to time to keep it mixed. 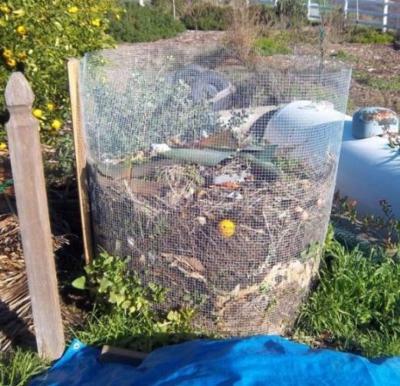 Any compost bin you use should be mixed periodically (turn it every week to finish it in a few months, or let it sit and it will take a year or so). The tumbler just makes it fast and easy, and keeps the compost off the ground where tree roots/vermin will invade. Hope that wasn’t too much! He ended up building a pretty solid looking cinder block bin with a hardware cloth base to house the worms outdoors. It’s inexpensive, low profile, and should keep the tree roots out (for awhile at least). I dropped off a container of red wigglers on Sunday, so we’ll see how they like their new home! In case you needed any more reason to update your home or business with insulation, efficient light bulbs, or a solar panel, the State and Federal governments sponsor programs and incentives you may not know about! There are 89 incentives for homeowners in North Carolina, 53 for you Ohioans, and 141 for Minnesota! Get on it. Stop whatever you’re doing, and visit http://www.poweringanation.org/coal/ to watch the “interactive film” put together by UNC Chapel Hill’s “Powering a Nation” team and released just last week. It is, at the same time, both beautiful and chilling. The series of videos and infographics follow families in West Virginia, Illinois, and Wyoming whose lives and livelihoods are both dependent on, and threatened by, coal as our nation’s primary energy source. In one of the first video vignettes, a young woman wrestles with her desire to leave home and attend college, and to stay near her family in West Virginia. The daughter of a coal miner, she proudly states that she will never stop defending coal. Casting her words in sharp relief, the girl’s mother crosses herself as her husband leaves the house, understanding that every day he goes, he may not return. The site offers a series of video vignettes with some really stunning cinematography and a handful of infographics and interactive calculators that show just how dependent on coal you (and I) really are. No, you’re not going to have to switch to CFLs if you don’t want to. Stop hoarding incandescents already. Yes, the new bulbs should save you money over time. Our good friends at the NRDC make it about as clear as can be in their helpful infographic. But if you’re the kind of person that would like to continue wasting money, let me know and I will gladly take your cash, checks and PayPal. What are friends for? Here’s a list of weatherization and energy related jobs available in North Carolina. Though many are temporary, jobs like these are great for getting experience in the field, and more importantly, making contact (and friends) with people who may be able to offer permanent positions. Get going! The NC Energy Office Weatherization Assistance Program is recruiting for the below positions located in Wake County, Carteret County, and Asheville. The first 9 are temporary positions (through March of 2012) and are part of a multifamily pilot project. The last 2 are permanent positions with Weatherization and are located in the NC Energy Office in Raleigh.Details and application instructions may be found below. Looks like my old job managing UNC Chapel Hill’s Climate Action Program is still up for grabs! I come to bury PowerMeter, not to praise it. So let it be with PowerMeter. As you’ve no doubt heard, last week Google canceled its PowerMeter home energy monitoring app and Microsoft burned down Hohm. The efficiency community and green tech circles are exploding with commentary and blame: it was the monolithic utilities, it was the uncaring masses, it was just ahead of its time. Well, I come to bury PowerMeter, not to praise it. I think Hohm and Powermeter had some good features, but they were far from an efficiency revolution we all expected. In fact, I think they were just the first shot in a much longer engagement. Look, I am an energy geek. I do this for a living. And with PowerMeter, I got some interesting initial savings. But over time, I kind of lost interest in what PowerMeter could tell me. My consumption was driven far more by the temperature outside than my behavior, and because PowerMeter didn’t really separate out those drivers, I slid into complacency. There are two things that are going to push home energy monitoring over the tipping point: higher electricity prices, and direct, specific recommendations. The average person is just never going to scan a time series of their energy data and get motivated to seal their attic. And I think that’s okay – it’s on us as efficiency experts, utilities, and software developers to make it so easy (and so financially beneficial) that it’s the default behavior, rather than a special effort. The pieces are falling into place. My local utility, Duke Energy, just filed for a 17% rate increase for residential customers. They won’t get it, but you can be sure prices will continue to rise. When your electric bill rises, you’ll have more incentive to eliminate waste. And you’ll know what to do because someone will be monitoring your energy use and offering you helpful suggestions. They will ultimately even help you get the work scheduled and subsidized by the utilities. If you were a PowerMeter user, check out one of the 7+ other websites that can take your energy data and tell you the same things that PowerMeter could. Some of those sites, like PlotWatt, even offer disaggregation – an appliance by appliance breakdown of how you’re spending. Nope, no one really requested that I tweet, but after dipping my toe into the twitterverse at a recent Startup Weekend, I realized that twitter might be a helpful venue for my interests and free time. I typically stack up a long list of “hey-you-should-see-this” links that I fully intend to blog about, but that get lost in the shuffle either due to the limited commentary I’d like to add, or the speed at which news happens in the lean/green/clean and data/infoviz space. It’s an embarrassment of riches. So, if you’re the kind of person who likes to tweet, follow @fireflyeco for the latest news and commentary on data-driven, Lean sustainability. If you’re the kind of person who doesn’t like to tweet, you can still keep up with my latest posts in the sidebar on fireflyeco.com. I’ll reserve blog posts for the items that just beg for more in-depth analysis. Let’s be clear: is this recyclable? When I have a plastic container, I want to dispose of it. I don’t want to throw it in the garbage, but I also don’t want to earn a graduate degree in polymer chemistry just to know whether it’s recyclable in my area. And if you make me think about it too long, I’m going to dump it in the recycle bin and contaminate all of your precious clean recyclables. 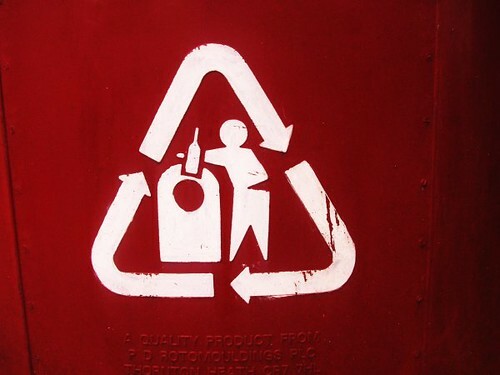 ‘Round here, we can recycle plastic bottles (the neck is narrower than the body), but we can’t recycle plastic tubs because they’re molded in a different way and the two types of plastic will not melt at the same temperature. I know this, and deal appropriately, but I can almost guarantee you that most people either don’t know it or don’t care. Putting a recycling arrow triangle on the bottom of the bucket with a little number is not going to help things. So, what’s to be done? What if we make it a little clearer, the way Sustainable Packaging Coalition aims to do. That’s it. That frozen food package has three types of materials – one that’s “widely recyclable,” one that’s completely non-recyclable, and one that might be recyclable depending on where you live. Easy. In the end, this is what the consumer cares about, and perhaps it’ll drive the right kind of purchasing behavior. If I have two choices, and one is not recyclable, it may guide my hand to the more sustainable option. The only downside is that the labeling is currently voluntary. There probably won’t be much compliance from the manufacturers of landfill-destined junk. PlotWatt wins the GE ecomagination prize! GE has announced the winners of its second ecomagination prize, and PlotWatt won! If you’re quick, you can catch the live feed here or look at some of the press we’ve already received. We also have a live demo up on the site, and a new about us and FAQ page. Exciting times!